Over 15.000 server clusters run Storage Spaces Direct (S2D) to implement hyper-converged infrastructure (HCI) powered by Windows Server 2016/2019 and based on validated hardware. Join this live webinar to understand why organizations around the world are adopting Storage Spaces Direct, the best-kept secret in HCI, and to learn how Dell EMC together with Microsoft can help you accelerate IT transformation with Dell EMC S2D Ready Nodes. This webinar will also cover the latest news about Windows Admin Center and new storage features in Windows Server 2019. 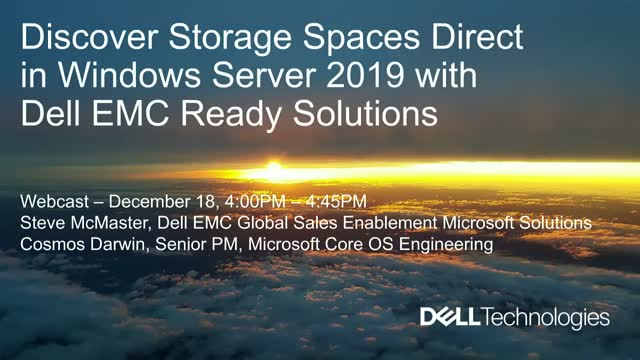 Join Cosmos Darwin (Microsoft) and Thomas Andersen (Dell EMC) to learn how Microsoft Azure Stack HCI combines Storage Spaces Direct in Windows Server 2019, Windows Admin Center for management, and pre-configured Ready Nodes from Dell EMC to deliver enterprise-grade hyperconverged infrastructure. During this live webcast, Cosmos will share what’s new with Azure Stack HCI, and Thomas will explain why so many customers choose Dell EMC Ready Nodes to consolidate their IT environment and realize faster performance, greater operational efficiency, and cost savings. Cyber criminals are continuously shifting their attack techniques to better target endpoints. As more than one-third of cyber-attacks are now non-malware based, adversaries can exploit gaps in traditional antimalware solutions used in isolation. Many businesses are injecting ineffective security tools into their environments, ultimately adding complexity without directly addressing the problem. These disconnected solutions require ongoing diligence and expert resources to analyze a multitude of security alerts and identify compromised devices. Yet, with the growing cybersecurity skills gap, businesses don’t have the resources needed to manage their security infrastructure effectively. Dell SafeGuard and Response helps organisations address these challenges. It is a portfolio of next-generation endpoint security solutions that combines the managed security, incident response expertise and threat behavioral analytics of Secureworks® with the unified endpoint protection platform from CrowdStrike. Dell’s modern and effective approach designed to prevent, detect and respond to the shifting threat landscape makes it easy for organizations to protect their data with the industry’s most secure commercial PCs. Are you confident your business critical data is protected? According to the recent market research Global Data Protection Index conducted by Vanson Bourne, the volume of data being managed is growing at a phenomenal rate from 1.53PB in 2016 to 9.47PB in 2018 in EMEA - but organizations are struggling with protecting new workloads like AI, cloud-native apps and IoT. In fact, 86% of organizations in EMEA think their current data protection solution will not enable them to meet all future business challenges. Join our live webinar to learn more about the state of Data Protection Maturity in EMEA. Designing and building facilities to support our ever-growing appetite for content is something that creators and facilities need to get right. Whether you own and operate a single workstation and use it to craft documentaries, or are operating a complex studio or data centre, you'll face many of the same challenges as you create, manage and deliver your work. Simon Haywood - Dell EMC CTO for Media & Entertainment in EMEA - looks at how systems are interconnected, and talks about the joined-up approach of vendors, integrators and customers working together in a partnership - enabling the production of great content. Exploring a future driven by transparency, where creatives own the ability to manage and validate their intellectual property. Learn how media and broadcasting organisations are managing to connect Data and Digital Content to solve their challenges across all business units in this streaming, Cloud world. In this age of mergers and acquisitions, many organisations struggle to manage all their data sources holistically. This is exacerbated by the onset of the “Hybrid Cloud” where there is a mixture of on-premise “Private Cloud” data repositories, combined with “Public Cloud” initiatives. Managing traditional Business Systems such as CRM and ERP, is only part of the picture; Distributing Digital assets around the world in the correct format to the correct destination in a timely fashion is also a Distributed Business challenge. Learn from Dell Technologies who are currently working with 7,500 customers addressing these issues using Dell Boomi, a Cloud based Integration Platform as a Service. The recent launch of Dell EMC Unity 4.5 brings new capabilities to our All-Flash and Hybrid Flash unified storage platforms – making it more powerful than ever before. With each subsequent release, we have continued to fine tune the Dell EMC Unity portfolio, focused on impactful innovations that drive new levels of functionality and efficiency that our customers expect. We hope you can join Stewart, our EMEA Field Evangelist to understand more and discuss any questions you may have. Learn the Dollars and Sense of Optimizing Your Portfolio. We will share with you the process for evaluating and optimizing your application portfolio and the financial and business impact of doing so. Dell EMC has partnered with VMware to deliver a seamless tenant self-service DPaaS for VCPP partners leveraging VMware’s vCloud Director (vCD) platform. Providing the best customer experience, Dell EMC and VMware offer clients up to 80% less cost to protect, provide unparalleled levels of service performance and offer flexible DPaaS controls including ad-hoc backup, policy-based backup, and self-service restore options through a unified interface. Join us to learn how to best protect end user VMware workloads. With just 12 months to go before Windows 7 becomes end of support (14 January 2020), it is critical for organisations to accelerate their planning for and deployment of Windows 10. We are therefore delighted to invite you to our forthcoming Live Webinar “Build your Readiness Plan for Windows 10 Migration” on Thursday, 31 January 2019 at 11.00 am. Join Dell EMC, in partnership with Microsoft and Intel to hear how organisations are successfully transitioning to Windows 10 and experiencing superior security, better performance and the ability to get more things done– all with maximum support and ease of use. As industries evolve through digital transformation, solution builders and their customers require a new generation of solutions to support their applications. Dell EMC CTO Alan Brumley and special guest Dr. Mahesh Saptharishi, CTO of Avigilon – a Motorola Solutions Company, will share their perspectives. Graeme Sutherland will be presenting an overview of the product and DPS as a whole and Sal DeMasi will be presenting a demonstration of key attributes of the appliance. There will be time at the end of the webinar for questions and also the opportunity to have a 1-1 Demonstration if you feel this will be of benefit to you. We hope you enjoy the webinar and if you have any questions please feel free to ask. Ron Pugh, VP Americas and Damian Murphy, Advisory SE, Dell EMC OEM/IoT. Mike Boudreaux, Connected Services Director, Emerson. The implementation of Industry 4.0 can help industrial companies gain competitive advantage by leveraging new digital technologies across the full value chain. IDC has predicted that by 2020, 60% of the top manufacturers will rely on digital platforms that enhance their investments in ecosystems and experiences and support as much as 30% of their overall revenue. From leading edge process control and measurement to the factory floor, Dell EMC OEM & IoT is helping industrial companies innovate faster, optimize operations and create new revenue streams by leveraging customization and secure Tier 1 infrastructure, global support, world-class supply chain and broad partner ecosystem. Join us to discover how Dell EMC OEM & IoT solutions can help you drive business value in the era of digital industrial revolution. Business needs evolve, especially in this time of workforce transformation. Avoiding complexity, keeping workers productive, and staying flexible are more important than ever. That's why the "as a service" model of PC management is becoming so popular. And why a partnership with Dell makes so much sense. Dell can simplify it all for you. We've developed a PC as a Service model that reduces the burden and cost of PC management. It's a flexible approach to PC that doesn't force you to comply with a set of fixed requirements. We know keeping your end users productive is top of mind. That’s why good systems management is so important. But it can be difficult to stay on top of deployment, configuration, compliance and access. Dell can simplify it all for you. We’ve developed products and services that will keep your systems running at peak efficiency so you can spend time and labor on the more important and strategic parts of your business. Employees want the right technology for how and where they work. IT wants security, manageability and to stay within their budget. That’s where Dell can help. With solutions like PC as a Service and the broadest portfolio of products available, we can help you turn this challenge into an opportunity. Our options can help keep IT and your employees happy while strengthening security and reliability for your business and the people in it. We’ll be covering these topics and more at the on-demand PC Lifecycle Management webinar. • Balance between supporting end users and IT resources. • Reducing the burden and cost of IT management over the complete PC lifecycle. The Workplace is transforming. Brought on by the Digital Revolution. Today more and more people work outside a traditional office space. Work is no longer a destination but an activity. One where users of technology expect more and also where with innovation in workplace technology can enable people more than ever before to be productive, creative and most importantly support workplace and technology wellness in the workplace. The Workplace is transforming and with this brings both opportunities and challenges. A key challenge is increased security threats for people working outside the office and therefore beyond secure systems within a traditional office. Being more mobile PC users are open to any number of security threats many of which the user are not even aware of that are happening right under their nose. The webinar focus insights for all PC users against data loss and other related security threats. Webinar channel dedicated to IT and digital business transformation through trusted hybrid cloud and big-data solutions, built upon a modern data center infrastructure that incorporates industry-leading converged infrastructure, servers, storage, and cybersecurity technologies.